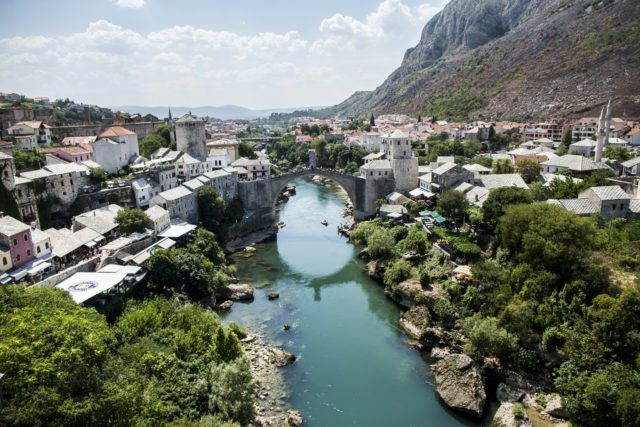 During the hot summer days of July, Mostar becomes just one big tourist mousetrap and the buses queued up at the main city artery can only mean one thing: crowds, huge ones, and that soon the traffic over the old bridge will be managed by traffic lights. With humidity reaching its peak and our stomachs rumbling, our expedition needed a short break. In a man’s world, this tends to mean a severe loss of focus and chronic levels of grumpiness, so I instinctively knew that my excellent skills at hunting out great restaurants that I’d acquired over the years wouldn’t function in this situation. I therefore resorted to the precautionary manoeuvre that included looking around the outskirts of the main tourist zones, but avoiding anything that had pictures of food stuck to jumbo-sized posters. No success, however, and throughout this entire time I kept thinking to myself why didn’t I just ask my good friend Benjamin for some advice. That had always seemed to be a good investment in the past. With hunger really kicking in buy now, my sons had slowly sunk into the apathy of wonderment at the architectural gems around us, not to mention the two-legged creations that seemed to capture their attention. But enough! The decision was made! We decided to return to the tourist hotspot, make our way past the hordes of selfie-takers and to hope for the best. In the midst of an abundance of near-identical restaurants, the one with a man around my age standing in front of it seemed like the best bet. The execution of the first part of his “programme” was solid, and he even suggested the local Mostar beer. He also somehow managed to impress a group of young Slovenian tourists with one vegetarian at their table, who ended up going with a Beef and Okra soup that turned out to be not so vegetarian. A gin and tonic helped alleviate her vegetarian principles, however, and she soon went through the ordeal. My older son was taken aback by the menu with its pictures of the food they were offering, which, according to him, is a clear sign of culinary misery. From there, things took a seriously downward spiral. Their Shopska salad was literally half Greek with a feta cheese that was more reminiscent of tofu. The temperature of the salad exceeded the temperature of the air and the refreshment we were expecting from it quickly faded away. Already disappointed we went for the safe option in the form of ćevapi, thinking they couldn’t be much different to the ones in Sarajevo (with a football signature at Hodžić’s) or the ones in Travnik. Our already weakening smiles vanished completely when our order landed on the table. They had probably been bought at a local grocery store and the somun bread…ugh! What shocked us even more than the egregious food, however, was the bill, written by hand on a crinkly piece of paper with a lovely message on the bottom: “Primaris” – distribution of pleasure. In the end the views of the famous bridge turned out to be quite expensive and we quickly folded up our tents and left in anger. It looks like some robust comments can quickly turn waiters into magicians, as all of them managed to immediately disappear into thin air, unavailable for any further communication. I can’t believe we got caught in a tourist trap. It completely rocked my travel confidence, but solidified my hard belief in the importance of finding “off the beaten track” experiences, like the one we had on the Jahorina mountain a day later. This entire story of ours was heightened even more by the sight of two merchants who were making fun of two Korean souvenir shoppers in a typical vulgar Balkan inferno. Sadly, I guess we need to start getting used to these kinds of tourist fiascos in the Balkans. An individual experience can’t possibly make a change and TripAdvisor is also quite powerless against mousetraps. The more we are aware and educated, the harder it will be for greedy caterers and salesmen to trick us and they will slowly realize what value for money is. Outrageously high prices and ripping off tourists is something people have always been victims off, but for us the cynism of knowing where we were sitting really fanned the flames and was the reason behind the need for this reportage. Any passing resemblance to the congress industry is, of course, merely coincidental.